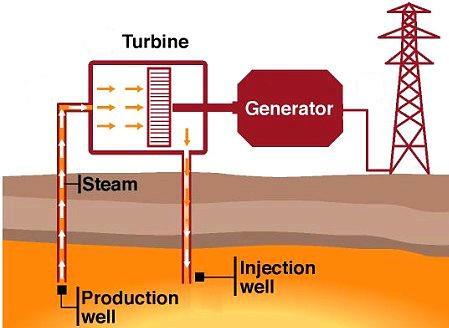 Plans have been revealed for what will be the first geothermal power plant to be built in the UK. 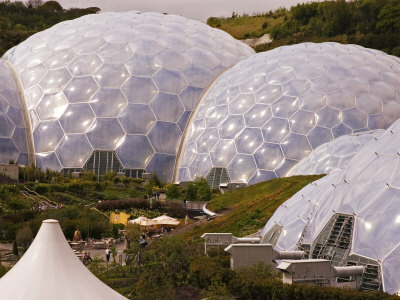 In a joint partnership between EGS Energy – a geothermal power company – and the Eden Project in Cornwall, a 3MW geothermal power plant will be constructed. It is designed to supply all of the power requirements of the Eden Project with any spare capacity fed into the National Grid. It will also providecarbon neutral heating, potentially enabling the Eden Project to grow more fruits and vegetables out of season, and also more exotic crops. Approximately 2-3 miles below the ground in Cornwall lie granite outcrops heated to high temperatures by geothermal energy. It is planned that two 2.5 mile deep boreholes will be drilled in a disused clay quarry on Eden Project land. Water will be pumped down to a reservoir on the porous hot rocks where its temperature will reach over 150 degrees Celcius. The superheated water will then be pumped back up to steam turbines at ground level where electricity will be generated, and the remaining heat in the water (via a heat exchanger) used to heat up local buildings. The completed power plant will be a closed loop (since the steam created is condensed back to water and pumped back down to the underground reservoir) and so the environmental impact on the surrounding area will be minimal. Also the footprint of the plant buildings on the surface will be very small. The total cost of the the power plant is projected to be £15 million. When the plant is completed in 2012 it will generate sufficient electricity to power nearly 5,000 homes. The Eden Project will need only 20-25% of the generated electricity, and so the rest will be exported to the National Grid raising revenue and reducing carbon emissions. Unlike wind turbines and solar panels, a geothermal system such as this can run 24 hours per day every day. A similar commercial plant has been built in the German town of Landau and successfully generates up to 3.8MW of electricity. It is hoped that over 10% of homes in the UK could eventually be powered by geothermal power plants of this type greatly reducing our dependence on fossil fuels. EGS Energy Ltd – official website of EGS Energy, specialists in deep geothermal energy. Eden Project – official website of the Eden Project in Cornwall, UK.